New statistics from Manitoba's Office of the Chief Medical Examiner show the number of deaths linked to the drug fentanyl has nearly doubled in the last two years. It's expected that number will be even higher this year. According to the provincial office, fentanyl was either a contributing or primary factor in 20 overdose deaths in 2015. That number is up from 13 deaths linked to the drug in 2014 and 11 deaths in 2013. "It's certainly a significant trend and it is alarming," said Manitoba's acting Chief Medical Examiner Dr. John Younes. "Especially when you look farther west in Canada to Alberta and British Columbia and their experience. The numbers they have are so much higher than ours, even on a per capita basis. So, knowing what the potential is... it certainly gives us concern here as well." Fentanyl, a powerful opiod which can be up to 100 times more toxic than morphine, has been linked to deaths across the country and has sparked countless warnings from police and health officials. ​Younes said there are a number of facets to the problem including the demand for the drug, its availability and the fact it can be added to other street drugs. He estimates the number of fatal overdoses linked to fentanyl will increase again once all reports are completed for 2016. CBC News is aware of 10 cases where fentanyl or carfentanil was the cause or is suspected to be linked to the death so far this year. "I've been reviewing all the final autopsy reports from this year and looking at all the toxicology reports and counting up cases where fentanyl was the primary cause of death and also cases where fentanyl was a contributing cause and part of a mixed overdose," said Younes. "I think we're on pace at this point to be in the 30 to 40 range.... We have a number of confirmed cases already, but there's still a lot of outstanding toxicology reports we're waiting for." Arlene Last-Kolb expected an increase in the number of deaths related to fentanyl in 2015. In fact, she thought the number would be higher. 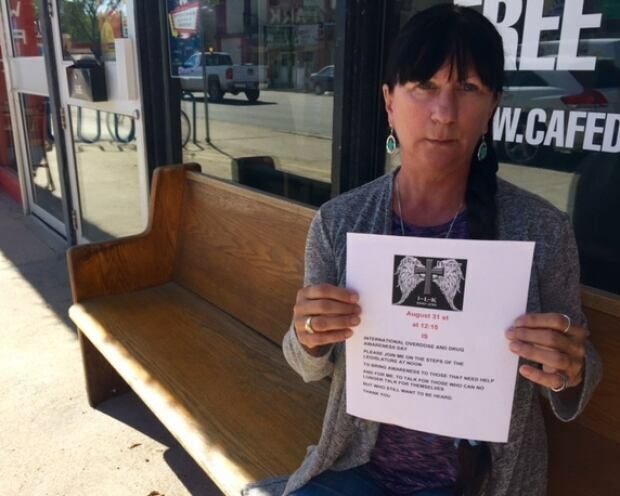 Her son, Jessie, died from a fentanyl overdose July 18, 2014. He was 24. Since then, she's spent her time advocating for better resources and services for those addicted to drugs, along with greater access to the overdose reversing drug naloxone. "It will grow, it will get worse," said Last-Kolb. "The only reason it hasn't even gotten worse is because naloxone is out there. Because we're using naloxone to help save people." Last-Kolb said the growing number of deaths tied to fentanyl highlights the need for better services and resources for people addicted to drugs. "There's people dying all the time," said Last-Kolb. "People that are living with addictions, like that have children with addictions, are living with the worry and fear that they're going to lose their child every day. And right now we've given them naloxone, which I think is good because that's all we can give them right now, but we truly need to look into long term care." Manitoba's Health Minister Kelvin Goertzen will be in Ottawa this week to to attend a national summit on the rise of opioids in Canada. Last-Kolb said she hopes to see action from the province when he returns. She's met with Goertzen, as well as members of Manitoba's provincial task force on fentanyl. "The quicker we move the better," said Last-Kolb. Winnipeg Fire and Paramedic Services is behind a public safety blitz to help educate the public on the dangers of fentnayl. "What we're finding is that every single day firefighter-paramedics are attending to drug overdoses," said Alex Forrest, president of the United Firefighters of Winnipeg. "Mostly opiate overdoses. Everything from fentanyl to carfentanil."